Appearance - Bats vary in size depending on species, but tend to average about 5 to 20 cm in length (head to tail) with a wingspread of approximately 15 to 40 cm--depending on how old the bat is. Bats’ bodies are covered with hair varying in color from a light beige color to black. Their leathery wings stretch across skinny arms and finger bones.When roosting, bats will hang upside down. Behavior - Most bats are insectivores, feeding on insects at night. Bats will frequent outside night lighting and pools where insects will be flying in warmer weather. Some bats prefer fruit, but those species of bats are not common in Local. Bats are known to hibernate in the winter. Bats tend to enter homes for safety and warmth. You are more likely to find bat problems occurring in the colder weather when it is harder for them to find a warm, safe place to live and breed. On the other hand, many accidental bat entrances happen in the summer months when bats are active and flying around. One or two may get trapped in your house while in flight, requiring them to be freed from the home. Bats are typically drawn to homes with awnings to sleep on, accessible chimneys, or places in which to hide. They also enjoy properties with water and trees which insects may hide. If you live near a water source, have a pool, or have a lot of trees or bushes on your property, then you may find bats taking up residence as well. While bats are helpful in reducing the insect population by feeding on them, bats are sometimes carriers of fleas and ticks. They can be infected with the rabies virus without showing any symptoms. Once inside, bats will relieve themselves in your home, and bat droppings and urine are a health risk for you and your family. 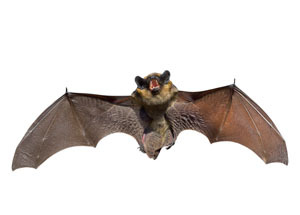 Should you find bats in your house, we can provide bat control to get these creatures of the night out of your home and back outside where they belong.